After a thrilling 4-3 victory over Orono in double overtime of the Section 2A championship, Breck heads into its eighth Class 1A tournament appearance in search of its third consecutive title. “How ‘bout that?,” Breck coach Les Larson said. “It’s an unbelievable dream to go there. Unless you’ve been there, you think you know what it’s like. It’s just the best thing in the world. Breck graduated 12 letter winners from last year’s state championship team forcing some to think this was a rebuilding year for the younger Mustangs. Larson has dealt with lesser experienced players before with positive results. “Last year wasn’t easy, either,” Larson said. “Everybody thinks you got all these guys returning from a state championship team. There are other challenges with a veteran club but these kids did everything that we asked them to. We kept getting better. The top five scorers for the Mustangs this year are all underclassmen – junior forwards Conor Andrle (19-43-62), Grant Opperman (25-34-59) and Wesley Iverson (28-20-48) as well as sophomores Thomas Lindstrom (22-28-50) and Matt Colford (14-32-46). Not all Mustangs will be participating in their first state tournament -- including senior forwards David Zosel (10-18-28) and Max Oppenheimer (8-14-22) -- but that doesn’t take away the glamour or determination for another title. 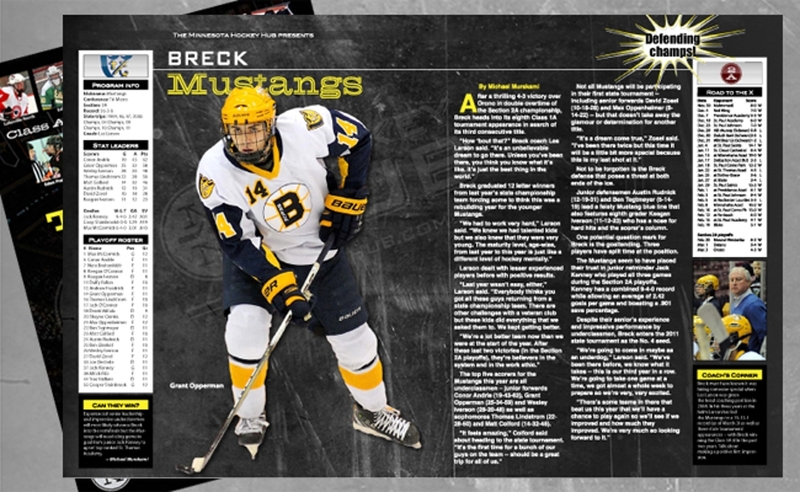 Not to be forgotten is the Breck defense that poses a threat at both ends of the ice. 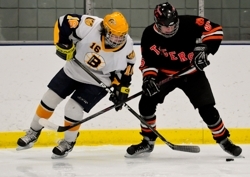 Junior defensemen Austin Rudnick (12-19-31) and Ben Tegtmeyer (5-14-19) lead a feisty Mustang blue line that also features eighth grader Keegan Iverson (11-12-23) that has a nose for hard hits and the scorer’s column. One potential question mark for Breck is the goaltending position as three different players have split time this year in-between the pipes. The Mustangs seem to have placed their trust in junior netminder Jack Kenney who played all three games during the Section 2A playoffs. Kenney has a combined 9-4-0 record while allowing an average of 2.42 goals per game and boasting a .901 save percentage. 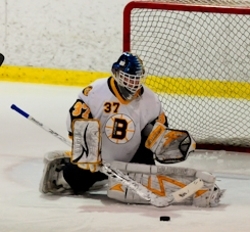 Despite their senior’s experience and impressive performance by underclassmen, Breck enters the 2011 state tournament as the No. 4 seed. “We’re going to come in maybe as an underdog,” Larson said. “We’ve been there before, we know what it takes -- this is our third year in a row. We’re going to take one game at a time, we got almost a whole week to prepare so we’re very, very excited. Experienced senior leadership and impressive underclassmen will most likely advance Breck into the semifinals but the Mustangs will need a big game in goal from junior Jack Kenney to upset top-ranked St. Thomas Academy. Breck must have known they were hiring someone special when Les Larson was given the head coaching position in 2008. In his three years at the helm Larson has led the Mustangs to a 76-13-1 record (as of March 3) as well as three state tournament appearances -- with Breck winning the Class 1A title the past two years. Talk about making a positive first impression. Before Breck’s hockey season had begun, the naysayers already had started. The Mustangs lost 13 seniors from a year ago, including three forwards from a top line that was one of the best in the state, four talented defensemen and their goalie. Surely, it was a down year for the two-time defending Class 1A state champs. The words struck a chord with the young players, and now, after powering through eight losses during the regular season, they’re playing their song — once again — at the state tournament. 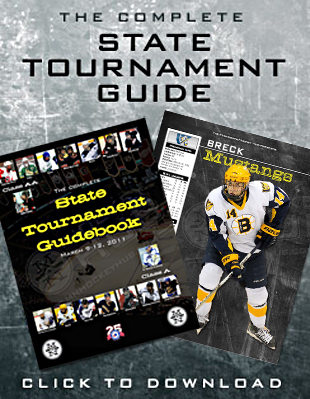 The Mustangs take on Thief River Falls at 8 p.m. Wednesday in the quarterfinals at Xcel Energy Center. The reaching wasn’t quite as smooth a process as the year before, when the Mustangs came in as the favorites and entered the tournament ranked No. 1 with a high-scoring, senior-laden team that had taken it all the way a season earlier. This year’s team took its lumps early in the season, losing 8-0 to Hill-Murray, which spurred a three-game losing streak. “But we weathered that, and we just got better from that point on,” Larson said. 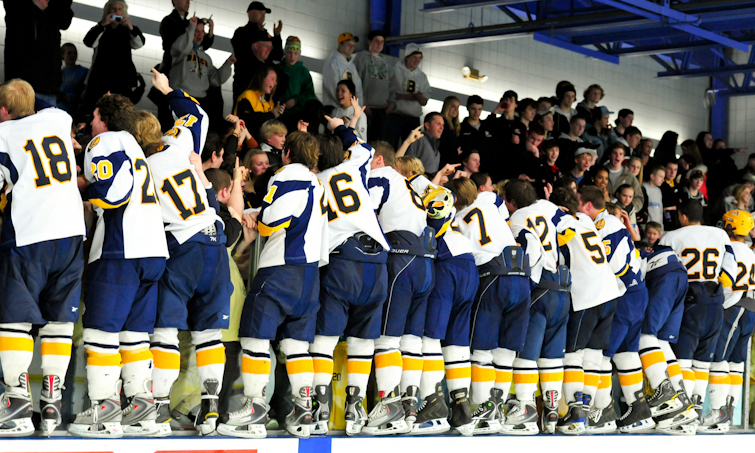 In the section final, Breck came back from a 3-1 deficit in the third period against Orono to win in double overtime. Some of that came through trial and error. And some through inspirational words. The Mustangs have the unique blend of maintaining a significant group of holdover players from the past two championship teams while not being favored to win a third. And the position suits them quite well.